It’s been a while since we’ve done a Monday Marketing. Last time, we talked about the Marketing Mix – the 4 P’s & 4 C’s of marketing, which all revolve around the Target Customer. For just about anything you’re trying to market – your book, your blog, your need for a raise, household chores – you have more than one type of customer. 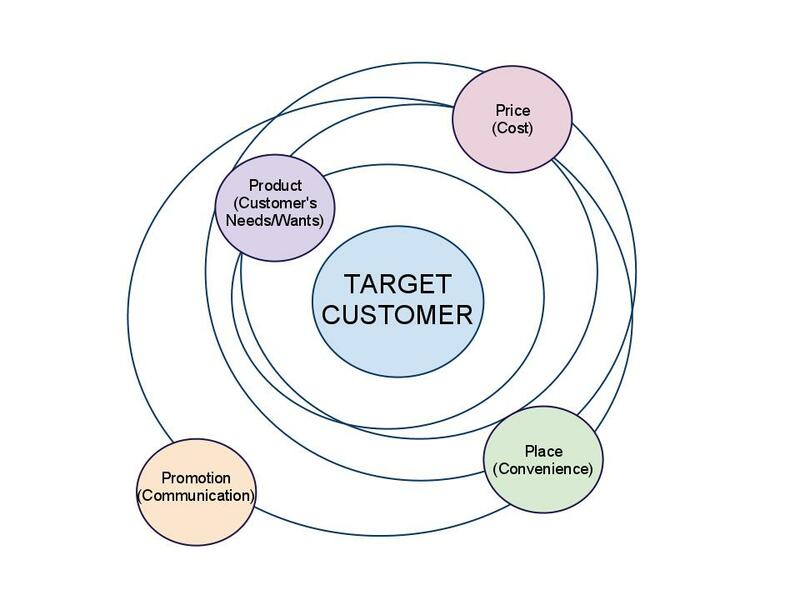 The rest of your Marketing Mix changes, depending on which customer you’re targeting. For example, if you’d like your husband to take out the trash, the “price” and promotional message are going to be different than if you ask your kid to do the same thing. Or perhaps your book is a mystery with paranormal and romantic elements. Your readers (and possibly potential agents) could prefer any of those genres. But when you’re marketing – querying or deciding which websites to advertise on – you have to pick your Target Customer and aim the rest of the Marketing Mix at that particular customer. So your query letter discusses the Big Murder Mystery when targeting an agent who represents mysteries. You know romance readers will love your book, so you put an ad on the I Love Fabio forum that emphasizes the romance (I have no idea if that forum exists, so please don’t ask where, no matter how much you’re dying to know). Sometimes your product even changes. Perhaps you get this great idea for a paranormal story and you decide it would be most enjoyed by Young Adult readers, but you’ve always written adult mainstream. You have to make adjustments to your style, your choice of words, sentence structures, pacing, etc., to meet the needs and desires of this new audience. If you’ve already started writing before you realize it would be better as YA, then you may even need to make changes to the character and some of the plot. Book bloggers often start additional blogs to create a new product for a different Target Customer (or target market – same thing, different word). On one blog, they review YA novels, on another they emphasize adult reading and perhaps even on another they do erotica or noir thriller. They probably don’t want their YA audience on that last one. The looks of each blog are probably going to be very different and the style of writing may be as well. If you have experience in both retail sales and computer programming and you really just. Need. A. Job., you’ll probably apply for both types. You’re not going to use the same resume, though. One will emphasize your sales experience and the other your techno-geek stuff. When you go in for an interview at Hoity-Toity Boutique, you’re not going to tell them all about how you can write video-gaming software. You’re targeting your Marketing Mix to the customer. The point is, you must know your Target Customer and their needs and desires, and then create a Marketing Mix specifically for them. And yes, that may mean you have multiple Marketing Mixes for the same product or for the same customer. Your customers all tune into WIIFM – What’s In It For Me. This applies to potential employers, spouses, kids, readers, buyers – anyone. It’s just human nature. They want to know what they’re going to get from you. Not what some other person with different likes and interests will get. What they will get. So you target everything toward them specifically. All that to stress to you that you must know your customers and then you must really know your Target Customer. Know their needs, desires, what keeps them up at night, what they dream about, what they fear, what their biggest problems are, what makes them happiest, etc. Know everything, or at least as much as possible. Think of someone you know who is your Target Customer and study them. When you know your Target Customer, then you can tailor the rest of the Marketing Mix to them and see success. Questions? Shoot ’em at me! Eek! Flashback to my drug rep days. Great advice, tho! Interesting post. I’ve been thinking of doing book reviews and put up a poll. So far, people are saying keep it on the writing blog instead of having a new blog started. Never even thought about the genres I’d be reviewing. hmmm Much to think about. This was so interesting and informative. I’ve no idea how to market myself and my future work. Small publishers expect this kind of help from their authors so I’m going to be learning a lot from you. Thanks for stopping by and following me! Email sent on the topic.